We have just released an update to CodeTwo Exchange Sync. Version 2.8.2.15 is now available for download on our website. The release includes a number of bug fixes handling issues reported by our users. Make sure to check the full version history of our product as well. Fixed: The program could not connect to the server if its AD attributes did not include information of the MS Exchange Server version. 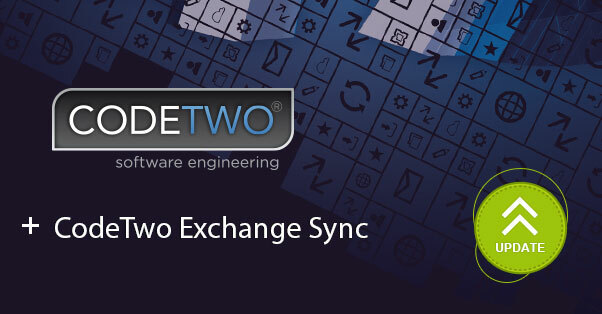 CodeTwo Exchange Sync update is highly recommended as it will result in software performance improvement. Update your software immediately or learn more about the process. CodeTwo Exchange Sync is an Exchange Server data synchronization tool. It enables Microsoft Exchange Server folders’ real-time synchronization, allowing you to create group calendars and other common items. The synchronization can fulfill various source-target scenarios, for example, replicate files from one folder to many, many-to-one, as well as from many-to-many. Synchronized items can be filtered and modified during the replication. The solution is widely known for its administrative purposes, as it enables users to synchronize their public folders with mobile devices or to create an automatically updated group calendar on Exchange. Visit CodeTwo Exchange Sync official webpage to learn more.